← Government should share tourism research… whatever there is of it. That article is bare nonsense. 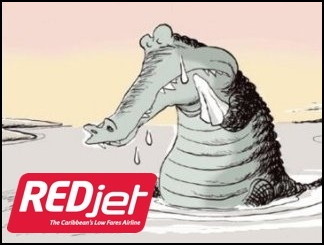 Redjet collapsed because of under-capitization and unrealistic fare structure. Remember Carib Express? To blame the Tourism Minister for Redjet’s failure is rediculous. As in some of the other accusations over the last four years and three months. What a pity that the BTO has another failure. Why is the same stupid mistakes occur rather than revamping the playbook and operation culture. The BTO and the PM have failed to deal with the real issue and that is to address why tourism is lagging and declining. RED jet was just a band aid on the real issue. Wake up before its to late and guest houses not regulated and not under strict government regulations is a pipe dream. The Bajan Reporter | Is REDjet a symptom of Freundel Stuart’s Inertia? red jet had to fight every step of the way, obsticles for every route, rumours etc. too many peole trying to make it fail. cant blame the competitors but we can blame the governments and their regulating agencies. Oh, the governments also own the competing airlines. pity i did not get a flight. whatever happened to the many ferry ventures tthat were to start over the years? maybe a viable option, something a bit more up market than the MV windward or even the windward clone. it should be cheaper to float on water than float on air. it would take longer but for the right price (cheap) one can bear with it. I voting for Bajan Free Party.!!! Barbados will do better to help RED JET than CLICO. For once they can find some thing to do with the People money than to build a 30M to 100million dollar build for the water company. That sounds like a reasonable business assessment to me! LIAT needs one such lamb, per decade, to justify its existence. Ponzi Sanford’s airline was the previous such lamb. And so air fares gone back up. So Carib. life returns to normal: yawn. Those who NEED to travel have their Company pay for it. and these small islands en’ sayin a pang! AIRLINES are an extremely expensive hobby for anyone/any country. Quickest way to become a millionaire? Start as a Billionaire -and buy yourself an airline. @RC..Just a clarification – Carib Express was designed to fail even before it did its first flight. Speedwing Consulting suggested the BAe146 planes, no one else wanted them and they needed to get them leased ASAP. The recommended management structure was so top heavy with expensive expats with iron-clad contracts that would make even CAL blush. The business plan was absolutely based on a LIAT closure within 9-12 months. And they totally misread the response of BWIA (BWee Express) and Air Jamaica (EC Express). IMO REDjet was different, but with the same end result. I do believe the LCC-type of model could work in the Caribbean, but ONLY if the Governments actually had a viable open-skies agreement in place – which they don’t. So the cards were stacked against them from the start. If they had listened to some local people (and NOT the so-called experts in their irory-towers), they would have known that the local aviation environment is severly toxic to growth, that T’dad would do everything to stall them, and that expansion into the US (as a Barbadian registered carrier) was a pipe dream. My feeling is, if the planes are actually owned by Airone Ventures (the business entity), and not REDjet (the operating airline), there is hope – just “return” the planes to Airone, who can remove the logos and repaint the tails, and lease them – crew and all – to LIAT for the Summer/Winter 2012 season. Since LIAT already enjoys the CAT1 status from the OECS, upgrading select routes in the network from the Dash 8 (50 seats) to the MD82 (149 seats) would be a benefit. They could also explore expansion into other destinations from the Antigua base.